Shanti Stupa is one of the magnificent Tibetan structures that has ever been built. The architecture and the beauty of this place are unexplainable. Shanti Stupa is a white-dome structure dedicated to Buddhism. This brilliant structure stands atop a steep hilltop at a dizzying height of 11,841 feet above sea level. This dominating altitude of the Stupa allows it to offer picturesque views of its beautiful surroundings and hence, draws the attention of thousands of tourists every year. 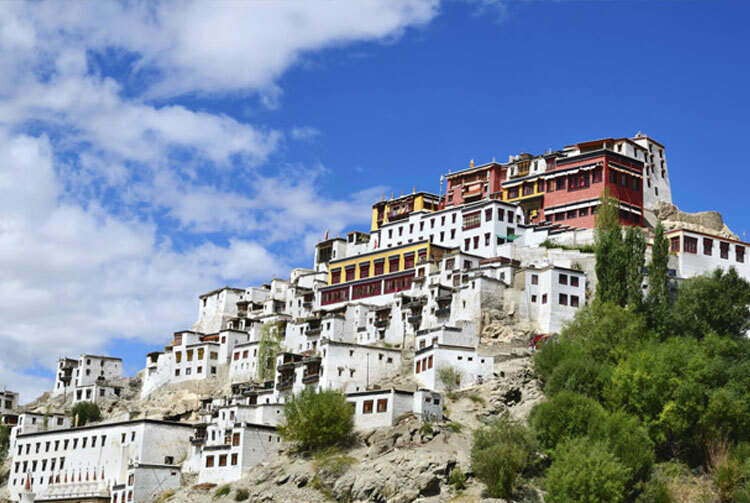 Facing towards the Leh Palace, the stupa overlooks the entire vibrant and colourful city of Leh and offers panoramic views of the Changspa village too. The beauty of Shanti Stupa takes a level up at night, especially during the full moon night when it is naturally illuminated by the moonlight. Owing to its altitude, the temperature here ranges from -20°C to -10°C as a result of which the lake freezes completely during winters in spite of its salinity. The famous and sparkling blue Pangong lake is situated near Leh-Ladakh in the Himalayas, approximately at the height of 4350 meters. This endorheic lake is 12 kilometres long and extends from India to Tibet, with two-thirds of it lying in the latter. A unique feature of the lake is that it does not remain blue throughout the year or even the day, rather it changes colours from azure to light blue to green and grey too! 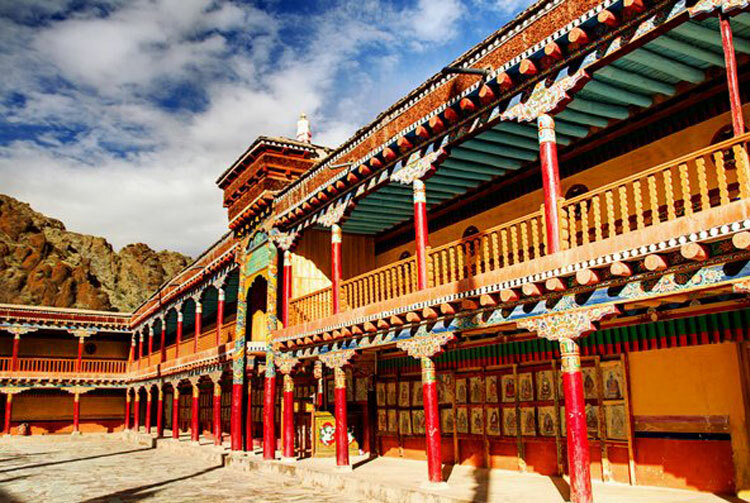 It has been a tourist attraction for a very long time and has gained further popularity after being a 'hot-spot' for many film shoots, apart from being an essential for anyone travelling to Leh - Ladakh. The sublime beauty, crystal waters and gentle hills of Pangong Lake are an exceptional example of the beautiful landscape of the region. The lesser known of the many lakes within the Changtang Wildlife sanctuary, Moriri Tso lake is a twin to the Pangong Tso Lake. 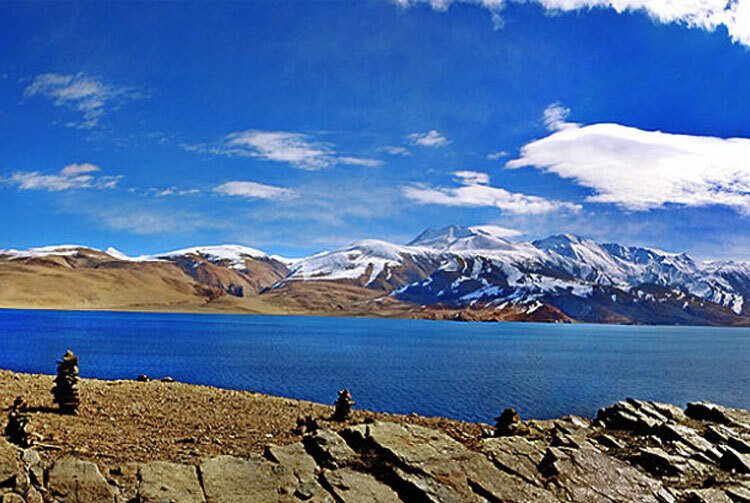 Located inside the Changtang wildlife sanctuary, this lake offers a scenic place of peace and tranquillity. The water body measures about 28 km in length from north to south, and about 100 feet average in depth. The lake is surrounded by barren hills, with the backdrop of beautiful snow-covered mountains. Since Moriri Tso lake is the lesser known of the two lakes, the crowd frequency is less too. Pangong lake always has many more people and is now crowded with little stalls that sell Maggi and tea. Tucked away in the remotest parts of the country makes this lake a perfect stargazing sight rendering a complete mind-stirring site. 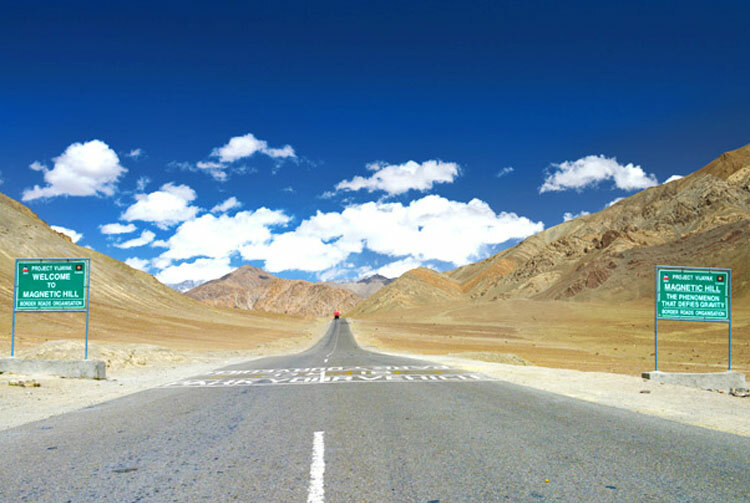 The popular Magnetic Hill of Ladakh is said to be a gravity hill where vehicles defy the force of gravity and move upwards on the hill when parked at the marked location. The hill lies at a distance of 30 km from the town of Leh, at an elevation of around 14,000 feet above sea level. 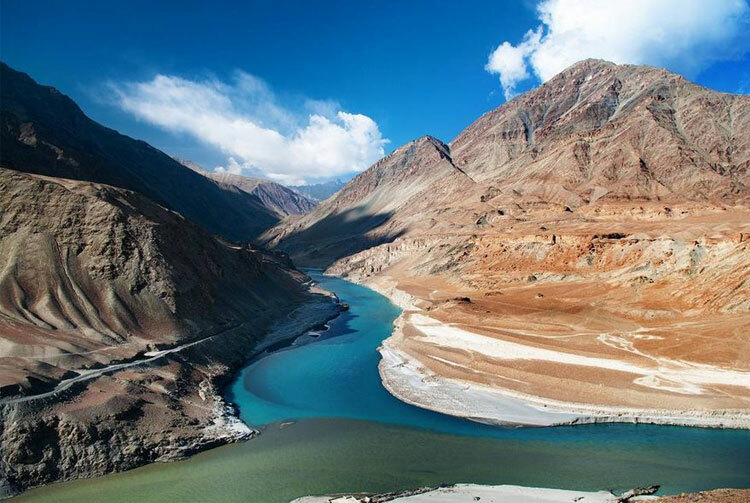 To the eastern side of the hill flows the Sindhu River, originating in Tibet and is an almost essential stopover for all those who travel to Ladakh. An optical illusion or actuality, the Magnetic Hill in Ladakh has mysterious magnetic properties that draw tourists from across the globe. 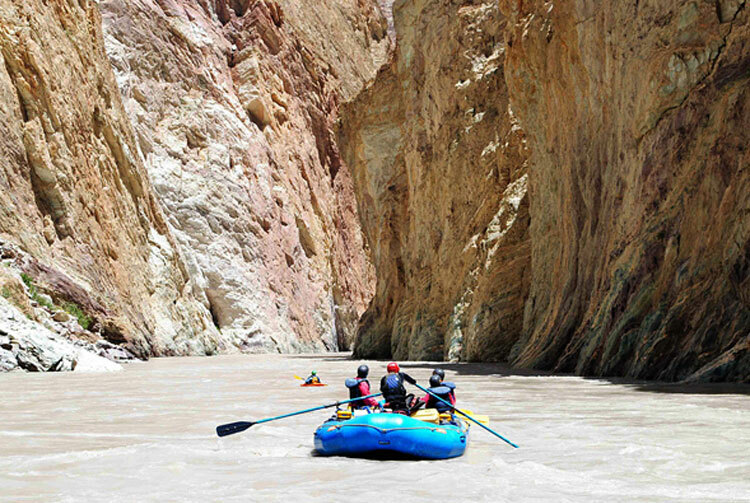 Rafting expedition is done on Zanskar River, called the Grand Canyon of India, with high cliff like gorges at certain places. The Zanskar Rafting expedition is one of The best river trips in The world. The best time to raft in Tiuni is from June to September. Make sure you pay attention to all the instructions carefully given by the guide. Also prefer to go for the activity in groups of 4, 6 or 8 as per the operator you choose. Make sure you have prior rafting experience before you indulge in the activity here. Red Chilli Adventure, and trek n raft are few of the operators. Carry a compact first-aid kit just for safety. Stretch before you go in for the activity, and always plan the raft distance in your package carefully. If you are travelling with older people or children, find a suitable rafting stretch for them. Travelling to the Namgyal Tsemo Gompa makes you encounter the steep mountains and submerges you in its serene and spiritual folds. 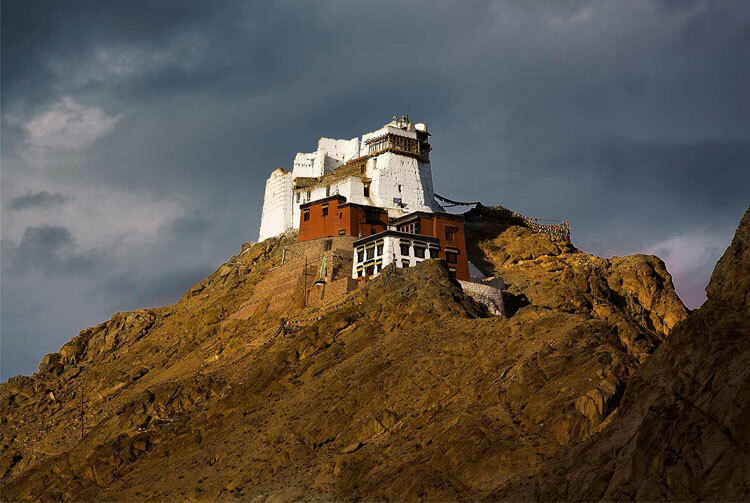 The monastery has long lured travellers seeking Buddhist experience but surprises them with something unexpected- the moon like, quiet and mystic expanse of Ladakh's landscape. Today, the guardian deities reside in the monastery's Gongchang and the fluttering Tibetan prayer flags in and around the monastery lend their own spiritual cadence. 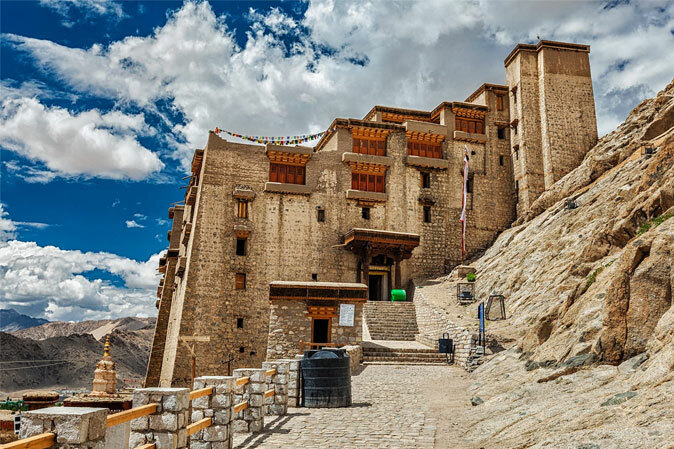 Alchi Monastery or Alchi Gompa is a Buddhist monastery, known more as a monastic complex (chos-khor) of temples in Alchi village in the Leh District, of the Indian state under the Ladakh Autonomous Hill Development Council of Jammu and Kashmir. The complex comprises four separate settlements in the Alchi village in the lower Ladakh region with monuments dated to different periods. Of these four hamlets, Alchi monastery is said to be the oldest and most famous. It is administered by the Likir Monastery. Alchi is also part of the three villages (all in lower Ladakh region) which constitute the ‘Alchi group of monuments, the other two villages adjoining Alchi are the Mangyu and Sumda Chun. The monuments in these three villages are stated to be of "unique style and workmanship", but the Alchi monastic complex is the best known. Thiksay Gompa or Thiksay Monastery (also transliterated from Ladakhi as Tikse, Tiksey or Thiksey) is a gompa (monastery) affiliated with the Gelug sect of Tibetan Buddhism. 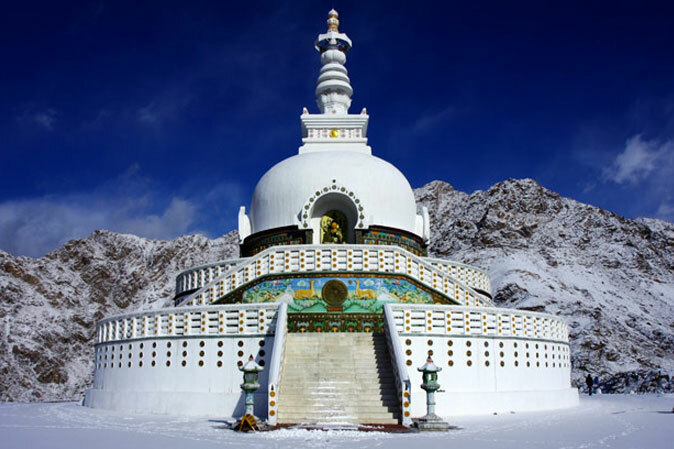 It is located on top of a hill in Thiksey village, approximately 19 kilometres (12 mi) east of Leh in Ladakh, India. It is noted for its resemblance to the Potala Palace in Lhasa, Tibet and is the largest gompa in central Ladakh, notably containing a separate set of buildings for female renunciates that has been the source of significant recent building and reorganisation.The monastery is located at an altitude of 3,600 metres (11,800 ft) in the Indus Valley. It is a twelve-story complex and houses many items of Buddhist art such as stupas, statues, thangkas, wall paintings and swords. 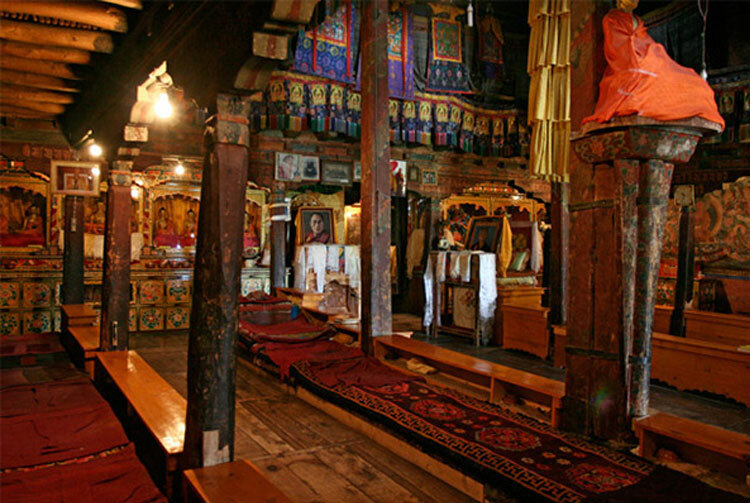 Hemis Monastery existed before the 11th century. Naropa, the pupil of the yogi Tilopa, and teacher of the translator Marpa is connected with this monastery. A translation was made by A. Grünwedel (Năro und Tilo,: Festschrift Ernst Kuhn, München 1916) of Naropa's biography that was found in Hemis monastery.In this manuscript Naropa (or Naro) meets the "dark blue" Tilopa (or Tillo), a tantric master, who gives Naropa 12 "great" and 12 "small" tasks to do in order to enlighten him to the inherent emptiness/illusoriness of all things. Naropa is depicted as the "abbott of Nalanda" (F. Wilhelm, Prüfung und Initiation im Buche Pausya und in der Biographie des Naropa, Wiesbaden 1965, p. 70), the university-monastery in today's Bihar, India, that flourished until the sacking by Turkish and Afghan Muslim forces. Khardung La (Khardung Pass, la means pass in Tibetan) is a mountain pass in the Ladakh region of the Indian state of Jammu and Kashmir. The local pronunciation is "Khardong La" or "Khardzong La" but, as with most names in Ladakh, the romanised spelling varies. 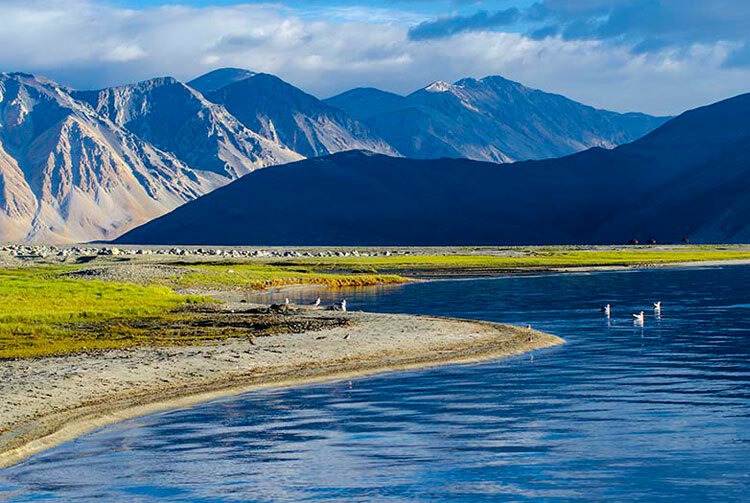 The pass on the Ladakh Range is north of Leh and is the gateway to the Shyok and Nubra valleys. The Siachen Glacier lies part way up the latter valley. Built in 1976, it was opened to public motor vehicles in 1988. Maintained by the Border Roads Organisation, the pass is strategically important to India as it is used to carry supplies to the Siachen Glacier.. 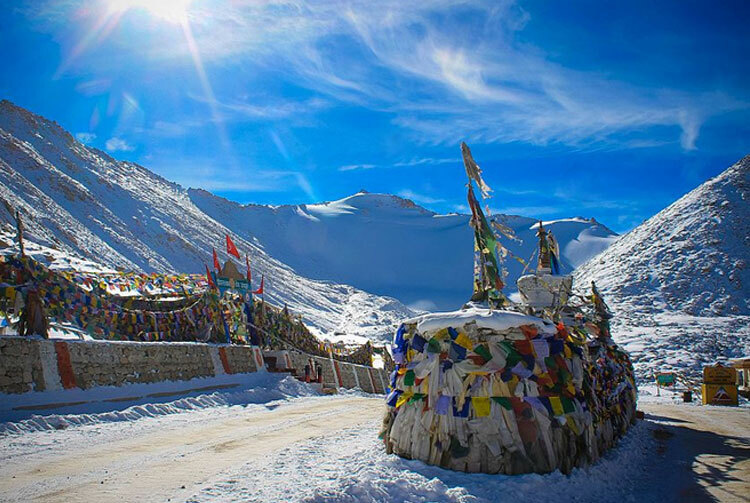 The elevation of Khardung La is 5,359 m (17,582 ft). Local summit signs and dozens of stores selling shirts in Leh incorrectly claim that its elevation is in the vicinity of 5,602 m (18,379 ft) and that it is the world's highest motorable pass.